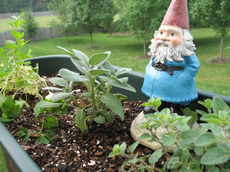 Aberfeldy hasn't been to the garden lately (he is, after all, a retired garden gnome) but decided to take the air today, tempted by the appearance of several planter boxes on the porch. They appear to be populated by kitchen herbs and lavender. We shall see if the mistress of the house remembers to water them, or not.